People don't usually love their bank. Usually they don't even like it. But TD defies gravity on this one. I've written about this before - TD is a loved bank in a very unloved category. What I didn't write was that I had been a customer of a major bank, grown very unhappy with its institutional feel and lack of flexibility. I disliked the personal interactions- because, at the time, it seemed as if the employees were counting seconds to coffee breaks. So, I switched to Canada's most loved bank. I've been happy ever since. And, here's another personal story why TD constantly knocks it out of the park. 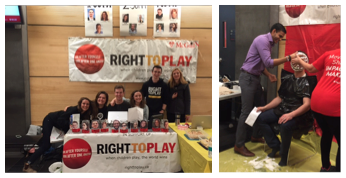 Every year, students on university campuses across the country organize a Right to Play fundraiser. For those unfamiliar with the charity, Right to Play is an organization that helps disadvantaged kids in disadvantaged regions play sport. The concept is that these kids learn teamwork, leadership, and receive all the healthy mind and body benefits that accrue with team sport. Right to Play helps kids in my city and around the world. The event that the students organized at my school works like this. The student volunteers get some profs, faculty members, and student leaders to donate 15 minutes to be pied in the face. A "pie-er" is then selected based on the highest donation targeted towards the volunteer pie-ee. Its a lot of fun, especially if you like whipped cream. Embodied in this approach is a fun competition amongst the volunteers to have the highest donation level. And this is where TD fits in. I decided to ask for a few donations from some of the business that I frequent. After explaining I the charity, and the friendly competition that I was in, Right to play generosity of employees of different businesses. But when I visited my local TD branch, the bank manager called me into this office. He said, "Bob, we love to help out good causes... we love to help local causes. And, we love you as a client. Let's see what we can do. I'll see if I can shake the tree..."
I walked out with a $500 check made out to Right to Play and saw first hand the excitement of the Right to Play organizers. (This size of this donation is in another stratosphere). In the back of my mind, I couldn't help think of the contrast of my old bank. This is not just about the donation, but from the warmth and love from which it was given. Thanks TD! Good luck Right to Play. And to the organizers of the fundraiser- well done!